Bah! These last few weeks have been crazy! I feel like I’m not getting any downtime, or at least no downtime when I’m not thinking about what I have to do or who I have to see. Basically, this just means that I haven’t been reading any books lately. I know, it's sad. The last book I read was back in the middle of January. January! That doesn’t mean that I haven’t been reading, however. I’ve actually gotten pretty addicted to another type of writing. Some of you may have already guessed what I’m about to say just by the vague language I’m using, but I’ve been unable to stop reading fanfiction. I know some people have strong thoughts about fanfiction. They either love it or they hate it. I love it. I think authors or TV show producers can sometimes completely ruin a character or world’s development. Oftentimes, authors/producers can forget what a character previously said in a book or show, whereas fans are sometimes dedicated enough that they can hang onto every word. Or, authors/producers just make horribly stupid decisions that fanfiction writers can fix. I’m currently into a lot of Supernatural, The Mortal Instruments, and Teen Wolf fanfiction. 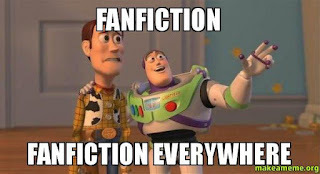 I’ve been reading fanfic since my freshman year of college when I first found out it was even a thing. Now that I'm three years into it, I realize sometimes I prefer the fanfic world to the show or book one. My roommate sometimes makes snide comments about fanfiction and how it isn’t the job of the reader/watcher to write the author’s story. I disagree. I also think no one should belittle you for liking fanfiction. 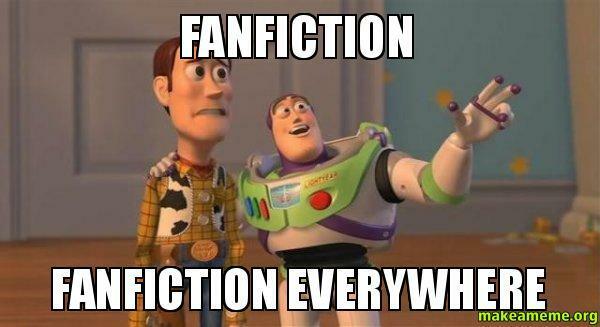 So, after that whole spiel, I guess what I’m trying to ask you guys is if you like reading fanfiction? And what are your thoughts about fanfic? Good, bad, neutral? Let me know.